The Price of Gold? What Does It Matter if Neocons Trigger WWIII? Taylor, can’t you ever be happy? 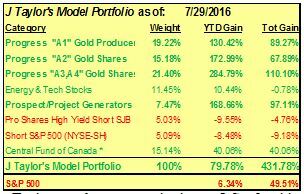 So far this year, the price of gold is up over 27%, your model portfolio is up nearly 80%, and all four sectors of gold and silver mining stocks in your portfolio are up triple digits. So why the less-than-ebullient headline? And this week, SilverCrest became your first 10-bagger this year. It’s gained 1,342% so far this year! Our Model Portfolio The short answer to that question is that I believe life itself, even if lived in poverty, is what is really important. And when the existence of human life on Earth is being threatened not only here and there in areas of the world where the U.S. is fighting wars, but also across the entire globe, what does the price of gold matter in the overall scheme of things? The reason my mind has gone in this direction for this week’s letter is because of two articles I read this morning from Zero Hedge that absolutely reflect my own understanding that it isn’t Russia or China that we need to worry about. Rather it’s the neoconservatives that have dominated American foreign policy in the U.S. to a growing degree ever since the implementation of the Federal Reserve and the IRS in 1913. Of course people like F. William Engdahl, who will be my guest on next week’s radio show, along with the likes of other guests like Ron Paul, Ed Griffin, and many others have been influential in my thinking. Engdahl’s God’s of Money along with Griffin’s Creature from Jekyll Island provides insights into who really owns America and controls its propaganda machinery used to try to keep Americans down on the mushroom farm. So, the mainstream propaganda turns the truth on its head. It says if you want peace and tranquility, vote for an extension of Obama. Vote for Hillary. If you are stupid and non college educated, go ahead and vote for Trump but if you do you are voting for World War III. Mainstream propaganda espoused by well-spoken Harvard, Yale, and Princeton Ph.D.’s disguise simple but obvious truths such as the fact that it is NATO that is threatening Russia, not Russia threatening NATO. When was the last time you heard or saw anything of Russian or Chinese warships off the coast of the U.S.? Yet the neocons are pushing very hard a false narrative that Putin caused trouble in the Ukraine, when in fact it was George Soros and his NGO that overthrew the elected government in the Ukraine that led to Russia moving into Crimea. 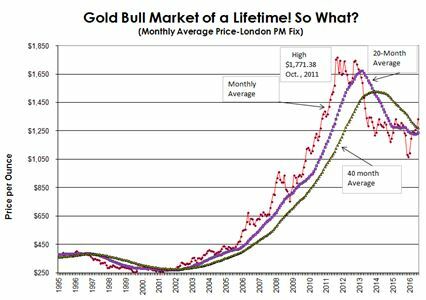 Just have a look at the chart on your left, which was part of an article published in the German Economic News translated by Eric Zuesse and published at Zero Hedge. 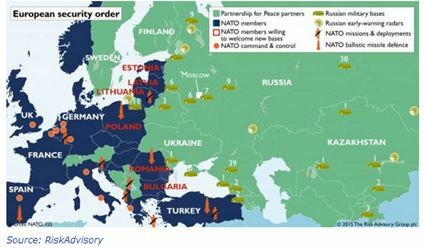 Read it here: http://www.zerohedge.com/news/2016-06-14/nato-begins-encirclement-russia. “NATO prepares a veritable military buildup in Eastern Europe: German soldiers are operating in Lithuania, the British take over Estonia, and US soldiers move in to protect Latvia. The Canadians will be in Poland. Also in the Mediterranean, combat units are being increased. Russia perceives the activity as a threat, but hasn’t yet announced any countermeasures.